The Peak, occupying the modern Peak District, had better land than Dunoting, and was probably the main base of the 'Kings of the Pennines' while the territory remained undivided. Dunoting had the windswept and fairly bleak countryside around Dent and Craven, was likely the lesser of the two kingdoms. However, the area's British influences live on in local place names, most noticeably the peak of Pen-y-Ghent. The name 'Pennines' is believed to be derived from the Celtic penno, meaning 'hill', although the earliest written reference to the name dates only from the eighteenth century. Dunoting was more probably known as Dunaution or Dynodion (or even Dunotion or Dynotion - spelling was variable, but the use of a 'y' would be a later progression of Welsh pronunciation, so the 'u' form is the earliest). The kingdom is sometimes called the kingdom of Craven, perhaps suggesting that this was its capital, while Dent would have been Lys Dunaut, the court of Dunaut. Following the division of the kingdom of the Pennines, Dunaut gained the northern section, but given his rough reignal length, he must have been an infant at the time. Both he and his brother were active in the later years of what appears to be two very long reigns, so it seems possible that they did not rule their territory in person from such an early date. If that was the case, perhaps someone else did, possibly a lost generation between Pabo and Dunaut (this speculative lost king is listed with the kings of the Pennines, as it is presupposed that the kingdom's division happened later than is generally thought, although it is just as possible that there were two lost kings, one each for Dunoting and The Peak). King of Dunoting (North Pennines). 'Dunaut the Stout / Great'. The Daniel of the British Church that is given by Geoffrey of Monmouth is St Deiniol, traditionally thought of as being the first bishop of Bangor, which lies within the kingdom of Gwynedd. According to the Latin Life of St Deiniol, he is the son of Dunod Fawr, and grandson of Pabo Post Prydein of the Pennines. He is apparently consecrated in 545 by St David, and dies in 584. The present Bangor Cathedral is said to stand on the site of Deiniol's first monastery. Aneirin is one of post-Roman Britain's best known bards. Sometimes referred to as Prince Aneirin of the Flowering Verse, and sometimes as Aneirin Awenyd (the Inspired), he is apparently present at the Battle of Catreath to witness the fall of the Guotodin. He is claimed as the author of the core text of Y Gododdin, the elegiac poem that records the heroic defeat. In later years he becomes a monk at Llancarfan Abbey in South Wales and is killed by a blow to the head delivered by Heidyn ap Enygan. Dunaut allies himself with the joint kings of Ebrauc and with Rhiderch Hael of Alt Clut to stake a claim against Caer Guendoleu for territory in the north. 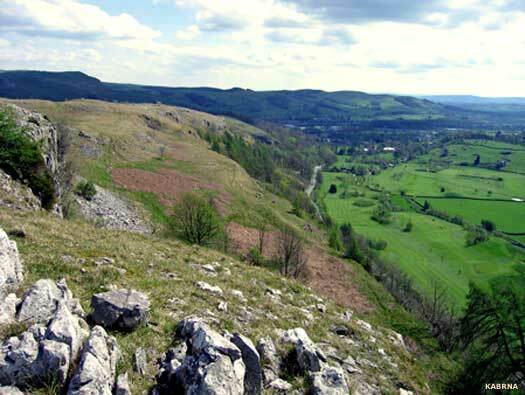 As Caer Guendoleu apparently passes to Urien Rheged upon the death of its king, this could explain Dunaut's later invasion of North Rheged, fighting against King Owein. The kings of The Peak and Ebrauc both have a valid claim to this territory through their joint descent from 'High King' Coel Hen. The Deirans continue to gain ground in neighbouring Ebrauc. 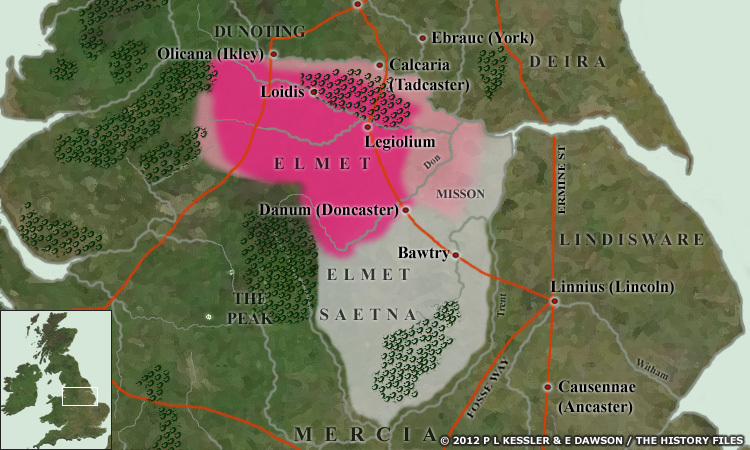 Although by now they seem to have already captured the coast, the city of Ebrauc (York) is known to have fallen later, between about 570-580, so it seems likely, given their dates of death (Annales Cambriae), that the sons of Eliffer had been fighting on from their capital until overrun. The loss of Ebrauc to the Deirans leaves Dunoting's long eastern border exposed. The Annales Cambriae records Dunaut's death in battle against the Bernicians during a general expansion of the latter that also sees the fall of The Peak around the same time. He is probably the last British ruler of the Pennines (unless the remnants of the territory are absorbed into North Rheged). His family are forced to flee to Powys, including his second son, the famous bard, Aneirin, while another son, Deiniol, is already in Gwynedd as the British Church's first bishop of Bangor. By this time the Deiran and Bernician Angles are pushing far into British territory, and the Iclingas are expanding from the south, with only Elmet and Cynwidion holding out as enclaves until 616-617, and South Rheged until about 613. Taken by Bernicia, Dunoting is eventually absorbed into the kingdom of Northumbria until the ninth century, when the Scandinavian kingdom of York claims the North.